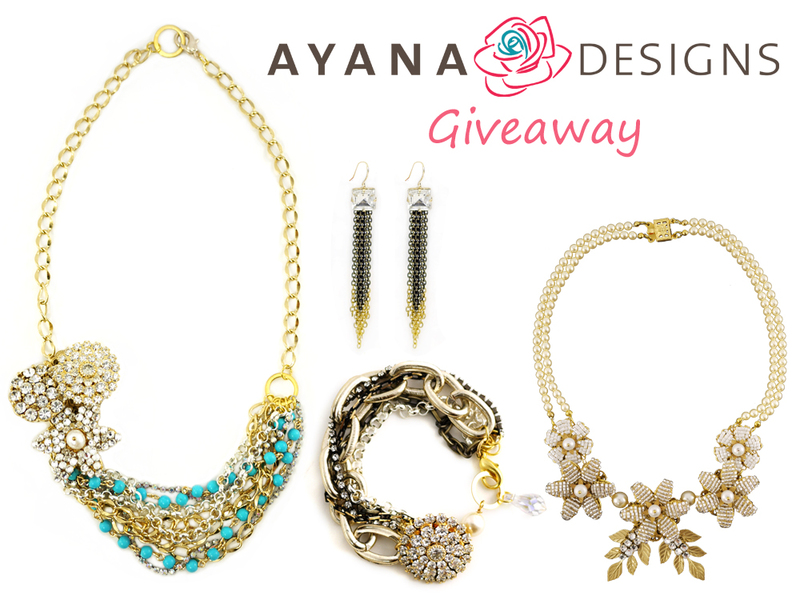 I've partnered with Ayana Designs to offer one lucky reader $55 credit to spend at their store! Their jewelry is sparkle-tastic! Leave a comment on this post with what you would buy with your $55 and your contact information. The winner will be chosen at random next Thursday 8/18 at midnight PST. It's so hard to choose! I think the Silver Filigree Charm Necklace is super adorable. I love the Mixed Chain and Brooch Bracelet! I love everything, but I'm a bracelet girl at heart, so the mixed chain and brooch bracelet would be my choice. I love the Juliet Clustered Pearls! Wow gorgeous! I've been dying for a big statement necklace, so I think I'd have to go with the Camilla Crystal and Turquoise Necklace. Following you both on FB, thanks for offering this! Everything is so beautiful it's hard to pick a fave! But I LOVE the Juliet in Clustered Pearls necklace. So sweet! I liked both of you on Facebook. Have a great day! That Camilla Crystal and Turquoise necklace is something else. I think I would use it towards that! Love the dip dyed fringe earrings! I would go with the turquoise flower necklace! the mixed chain and brooch bracelet, love! It's so hard to choose! I would use it either towards the Camilla Crystal and Turquoise necklace or the Long Topax Fringe Crystal Earrings! The jewelry is beautiful. Ahh I definitely want to get one of the chain bracelets! They are AMAZING!! I think I'd get the Light Green Stones and Chain Bracelet! :) It's gorgeous! Love the mixed chain and brooch bracelet...totally my style! Great giveaway! The jewelry is gorgeous! :) I would buy the fields of lavender and yellow stones bracelet- love it! I would buy the Camilla necklace; it's gorgeous! I 'liked' you both of FB. Thanks for the giveaway! Already liked you on fb and just liked Ayana designs :) it's so hard for me to choose one but I adore the Camilla crystal and torquoise necklace ! I would probably get the Fields of Lavender and Yellow Stones Bracelet, absolutely gorgeous! I would definitely buy a necklace, but even if I picked one out now I'd probably change my mind before actually choosing! I just liked both pages! I love the Camilla necklace, but would have a hard time choosing. Lots of great options! ohhh the light green stones and chain bracelet is so pretty. thanks for hosting the giveaway! ps. i'm also hosting a giveaway on my blog this month. hope you check it out. Love it all, but the mixed chain brooch bracelet has to be my fave...goes with everything..LUSH! I would choose the Silver Filigree charm necklace. Beautiful shop with lots of great pieces! Love LOVE the sparkle necklace!! Oh and I have liked you on FB for a while and now like Ayana too! I love the Camilla Crystal and Turquoise Necklace! It would be perfect with the coral dress I just purchased on bouchique! I love the Silver Filigree Charm Necklace! So cute! Hmmm... what to buy what to buy....what not to buy?? With my $55 i'd buy the Mixed Chain and Brooch Bracelet.... pick me pick me!!! I'm loving that Camilla Crystal and Turquoise Necklace. So fabulous! Oh my heavens, her work is gorgeous. How to choose?! I love the mixed chain and brooch bracelet. --- I like both Ayana Designs & Sterling Style on FB under: Nicole O. --- I absolutely adore this Turquoise Suede & Silk Ribbon Charm Bracelet! And it would have to be a toss up between the Amelia Blue Flowers and Pearls Necklace and the Sparkle Crystal Necklace. Everything is so pretty. these are so lovely, great giveaway! Everything is so delicate and beautiful, but the one piece that sticks out is the mixed chain and brooch bracelet! This would be a great addition to my fall wardrobe (which is currently lacking)! I would buy the Crystal Tassle Bracelet. It's so pretty! I love the Camilla Crystal and Turquoise Necklace! I love the Light Green Stones and Chain Bracelet. Super cute! i like both pages on FB; colleen b.
i would buy the Light Green Stones and Chain Bracelet. Black Crystal and Matte Gold Flower Earrings!! It's hard to choose! I love Claire Multi Flowers and Leaves Necklace and Ella Triple Turquoise Flowers Necklace. They're both stunning! I would get the Light Green Stones and Chain Bracelet. I think its subtle green stones are gorgeous and could really make any outfit classy! Its definitely a statement piece. Fantastic giveaway! I love the mixed chain and broach bracelets. Phoebe Chocolate Silk and Multi Chains Necklace- I see this making my favorite plain T into something special! I would choose the moxed chain and brooch bracelet. LOVE! I would love to have the Black Crystal and Matte Gold Flower Earrings. What beautiful fun jewelry! I liked Ayana Designs and I'm already a fan of Sterling Style on FB. My favorite piece is the Fields of Lavender and Yellow Stones Bracelet. I would buy the Light Green Stones and Chain Bracelet!! Soooo pretty :) I liked you both on FB! great giveaway!liked both of you on fb!i'd buy the ella triple turquoise flowers necklace!thanks again! i like the camilla crystal turquosie necklace! I like Peach Quartz Earrings. P.S. Do we do all 3 entries are pick which one or ones we want to do? I liked both of you on fb and I love the light green stones and chain bracelet! There are so many things to choose from, but my favourite is the Camilla crystal and torquoise necklace ! Lovin' the Light Green Stones and Chain Bracelet. What a key piece to enliven any basic separates with its soft, pretty pastel colors! Can't wait to don the jewelry! Done and done. I love the mixed chain and brooch bracelet!! I would buy this lovely Fields of Lavender and Yellow Stones Bracelet! Thanks so much! I'm in the love with the Light Green Stones and Chain Bracelet. They have some gorgeous stuff! Love the Camilla Crystal & Turqoise Necklace! Loving the Ella Triple Turquoise Flowers. Perty! I would use it towards the Pink Quartz and Jade Triangle Earrings. I would love those for a statement to an otherwise understated ensemble. I really like the Blue Silk Ribbon and Chains bracelet. I love the Ella Triple Turquoise Flowers Necklace...so great for dressing up my collection of tshirts. The Fields of Lavender and Yellow Stones Bracelet. The yellow and purple stones are beautiful together! I love the Light Green Stones and Chain Bracelet! I am in need of some new pieces. Mixed Chain and Brooch Bracelet!! I like both on FB (A. Mace). If I was the lucky winner, I would spend the $55 on the Crystal Vitrail Medium Necklace. Thank you both so much! Hey love I liked you both on facebook and I would buy Camilla Crystal and Turquoise Necklace and wear it with my new rust color Anthro top I just got and my high waisted eyelet Urban Outfitters shorts. I'm a statement necklace girl, so I would pick the Elizabeth necklace! I love color, so the Camilla turquoise necklace or the Lila pink flower necklace! i'd get the pick quartz and jade triangle earrings!! it would match my little streak of PINK hair perfectly. I would run straight for the Chocolate Silk and Multi Chain necklace! The 18th is my b-daaaay! I would love to get the Light Green Stones and Chain Bracelet as a present...gorgeous! Follow you daily. LOVE the mixed chain and brooch bracelet! Oooooo! So many great choices to choose from! Either the Mixed chain and brooch braclet or the Lila Pink Crystal Flower Necklace! Love the crystal flowers, so cute! Ohhh, these are lovely. I would like the mixed chain and broach bracelet. It's gorgeous. I think I would get the Claire Multi Flowers and Leaves Necklace. I would choose the Lila Pink Crystal Flower Necklace...I love the simplicity of the chain and the detail of the flowers, not to mention the pop of pink is fabulous! Definitely the Ella Triple Turquoise Flowers Necklace. I've been looking for something sleek, simple and classy to wear to the office, and this would be lovely! I would definitely go for the Light Green Stones and Chain Bracelet! It's gorgeous! So pretty, I would get the Josephine Pearl Bouquet necklace! I would definitely put it toward the Natalie in Ribbons and Lace Necklace. That piece goes perfectly with my maid of honor dress for my sister's wedding! Love classy. vintage. funky. fun. spin on this necklace. Tassels are big for fall, which is good because I love the tassel bracelet! I would buy the Elizabeth necklace! So gorgeous! Great giveaway! I'd spend my $55 on the Fire Polished Cobalt Blue Necklace! It's so awesome!!! It's so hard to choose, but I'd probably put it towards the Ella Triple Turquoise Flowers necklace or the Peach Quartz earrings. I'd definitely buy the Crystal Tassle Bracelet. mixed chain and brooch bracelet all day errday!!! I'm dying for the Claire Multi Flowers and Leaves Necklace ... I need a new statement piece!! I like both of you on Facebook. And I am in love with the Lila Necklace! Purple is my favorite! ooooh i want the Kate Flowing in Crystals and Chain Necklace! !